Let's be clear, vinyl isn't the savior for high-end audio. However, the format does live on as a niche format with nearly 2,000,000 units of new vinyl sold per year (source: Soundscan 2011), making the entire format's sales for every new LP pressed barely double platinum. With that said, many enthusiasts still hang onto vinyl for its classic sound, kitsch factor or, in some cases, snob appeal. Signs of these factors were boldly on display at the recent T.H.E. Show in Newport Beach, California. The event had rooms playing back records, as well as retailers selling everything from $50 new audiophile pressings of records from The Doors, classic jazz and beyond. For this review, I went looking for a turntable a bit more utilitarian, something that would allow me to play back what little vinyl I have left in my collection, yet wouldn't force me to have to go through Temple of Doom-like rituals in order to do so. 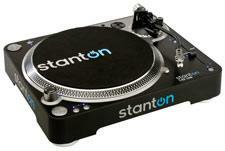 What I came up with was the compelling Stanton T.92 USB turntable. • Read more source component reviews written by the staff at HomeTheaterReview.com. • Explore receivers in our AV Receiver Review section. • See reviews for Bookshelf Speakers and Floorstanding Speakers. With a retail price of $299, the Stanton T.92 USB isn't your typical audiophile turntable. In fact, it's a DJ turntable. The nice thing about DJ turntables is they're built to withstand a great deal of punishment and are relatively easy to set up, for in the DJ world, silence isn't golden. TheT.92 is a direct drive turntable, i.e., no belts, and comes with the usual DJ accoutrements, such as speed and pitch controls. The T.92 comes complete with an S-Shaped Tone Arm, as well as a Stanton 500v3 cartridge. The T.92 has, unlike many turntables, a built-in phono stage, meaning you can connect it to any RCA style input on your preamp or receiver, which is a plus. It also has a USB (1.1), as well as an S/PDIF digital output. The reason for the USB and digital output is to facilitate in the transfer of your favorite records to MP3 via the included software. Stanton isn't the only manufacturer hoping to cash in on (or possibly start) the LP to MP3 movement; Music Hall and others have products offering the same functionality. Regardless, the T.92 is aimed at the no-frills music lover, someone who cares more about playing back and listening to their favorite LPs than they do about tending to them. The T.92 has a reported frequency response of 30Hz to 20kHz, with a total harmonic distortion rating of .03 percent. The turntable's signal to noise ratio is 65dB. The included tone arm has a length of 230.5mm, with a tracking force range of zero to three grams, with a cartridge weight allowance of three to four grams. For more on the finer details regarding the T.92's specifications, please visit the manufacturer's website. In terms of sound quality, the T.92 is a good performer, pretty much middle of the road among budget tables and by no means good enough to cut it for the dyed in the wool audiophile crowd. Still, as no-frills as the T.92 is, I rather enjoyed it - that is, when I was listening to a record that wasn't too tarnished. You see, enjoying a record has as much to do with the turntable/cartridge combo as it does the album itself. Despite the T.92's ease of use, there's no getting around the sound of an old or well-played album, which is why I purchased a few new LPs for this review in order to truly gauge the T.92's sound quality. The T.92's strengths come in the form of a fairly rich and defined midrange, coupled with solid low-end punch, which isn't surprising, considering its true target market. High frequencies are not as good; I would hesitate to even call them analog-sounding. Instead, they're a little on the two-dimensional side. Still, soundstage width is good, as is depth, though dynamics aren't altogether exciting. Noise was lower than what I remember from my last vinyl rig, but nowhere near as quiet as any of my digital front ends. There's no denying that LPs tend to have a soulfulness that many audiophiles cling to when defending their beloved format, and at times the T.92 conveyed this, though I must say the effort I put forth in order to achieve it wasn't worth it. While the T.92 came closest to replicating the ease and simplicity of putting a disc in a tray and hitting play than any turntable before it, there's still no getting around the fact that it remains a turntable. In a DJ environment, the T.92's foibles will more than likely be brushed aside, but in the home, there are just too many variables and inconsistencies that are distracting. Is it entirely the T.92's fault? No, a portion of the blame falls on the format, too. Now, I cannot comment as to the quality of the more expensive or better-built Stanton products, but as an entry point into the niche market that is vinyl, there are better options, in my opinion. As for the T.92's LP to MP3 capability, I'm not sure I'm buyin' for the same reasons I'm not a rabid fan of vinyl - too many variables that get in the way of being able to enjoy my favorite music. Got a badly damaged or older record? Well, transferring it to a digital format isn't going to magically correct any errors. If anything, you're saving that bad sound quality for posterity when I'm pretty sure you can probably download whatever it is you wish to encode and have a better experience as a result. It's not that the T.92's USB and ripping software doesn't work, it does, but ... you get my point. Read about the High Points and Low Points, the Competition and Comparison and the Conclusion . . .